Tactics and Strategy are pre-requsities in this supremely intellectual one-on-one contest of the wills. Fortunes have been won and lost in this intriguing game that permits bluff and counter-bluff and rewards the bold and careful alike. As intellectually demanding as Contract Bridge, its supplanter, Piquet’s hazardous gentility can still cause the pulse to race as enormous risks are taken like no other card game on earth. Originating in France over 500 years ago, it was certainly played in England in the 1550s, before the reign of Elizabeth I, under the name of Cent or Sant. The French name was adopted about the time of Charles I’s marriage to the French princess Henrietta Maria in 1625. Piquet is deceptively simple: a short 32-card deck is dealt out, 12 cards to a hand, with 8 cards remaining from which additional cards can be withdrawn to replace discards as hands are improved. A bidding process then ensues, with points being claimed for long suits, runs, and sets. Bonuses apply for particularly strong combinations. Play then begins, with tricks being taken as in Whist. Points are awarded for each trick, and bonus points for the majority of tricks. Once played up to a hundred (hence the name, “Cent”), the hundred mark now indicates the Rubicon, a major hurdle to cross. A game consists of 6 deals, and a rubber might consist of three games. It is the bonuses that give the game its spice, its pulse-quickening appeal, to the true gamester. If one player can score 30 points in the bidding process before play begins and before his opponent scores anything, he can claim an instant bonus of 60. If he scores 30 before his opponent gets off the mark in the course of play itself, he gets a bonus of 30. 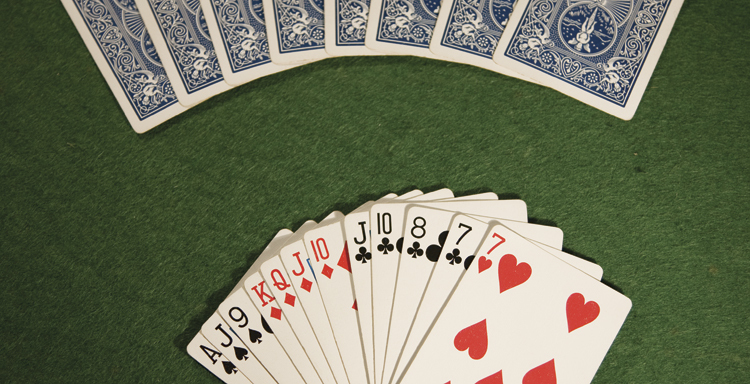 At the end of 6 hands, the winner of the game is determined by the difference in points accumulated, and the stakes, agreed in advance, will be so much a point, plus a hundred for game. For example, at a dollar a point, should the result be 102 points vs 101, the winner receives $101. Now for the Rubicon: If the losing player has failed to pass the 100 mark, he has “failed to cross the Rubicon”, and his score is added to his opponent’s. In the preceding example, if the loser had scored only 99, he wouldn’t be paying $103 (the difference of $3 plus a hundred), but the sum of $301 (99 plus 102 plus 100). The real skill in playing is in the discarding of cards in the hope of picking up better ones from the 8 cards remaining after the deal, and there are deliberate imbalances in power and precedence between dealer and opponent during a hand. As deal alternates after each hand, this imbalance averages out, but when it comes to the last hand, and it is clear whether or not a player is likely to gather enough points to cross the Rubicon, it can be tactically sensible to destroy any value a hand might have to avoid winning points which will be handed over to the winner of the game in cash form later on. Countless fortunes have been won and lost in Piquet due to the avalanche effect the bonuses have on scores if very good hands appear, and many an ashen-faced player has risen tremblingly to his feet having thrown everything away on the hope of crossing the Rubicon, and failing at the last. Unlike Poker, where you play with the money on the table, in Piquet you are playing for stakes that are determined by the luck of the deal and the relative skills of the players. And unlike Bridge, there is no partner to blame – only yourself.